TAKE IT EZE: Sexteto Mayor - La passion règne. Sexteto Mayor - La passion règne. The Sexteto Mayor is a tango music ensemble founded in April 23, 1973 by Luis Stazo and José Libertella. Since it's early days, the sextet has conducted tours around the world. 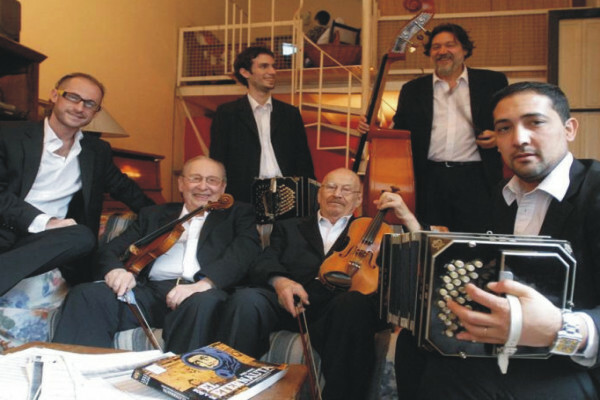 This has led them to become the most famous Argentinian tango sextet in the world. Sexteto Mayor has received numerous awards including the Latin American Grammy in 2003. In 1978 they performed in over 50 cities in Japan. In 1981 they performed in Paris at the opening of Trottoirs of Buenos Aires. This was their first presentation of global impact. Among others, Julio Cortazar, Yves Montand and Paloma Picasso attended the event. In November 1983 the show "Argeninian Tango" made its debut at the Chatelet theatre in París during the fall festival. It was in late October 1985, after having presented the celebrated show "Tango Argentino" in some cities in the United States, that they reached great popularity. Their performances in Broadway's Mark Hellinger Theatre, scheduled for six weeks, lasted for six months. Then they traveled to perform in Canada and went back to the US. Between 1986 and 1987 they performed in 55 US cities. In 1991 they performed in London for three months. In early 1993 the premier of the show "Tango Passión" took place in Coconut Grove, Miami and in May of the same year they performed in the Deutsches theatre in Munich, Germany. In 1996 he made an extensive tour of various European countries, including Finland, St. Petersburg, Moscow and Asia, Hong Kong and Singapore, with a total of 264 functions. In 1997 there was another extensive tour of Europe that included Athens, Thessaloniki, Rhodes and Istanbul and Asia in Taiwan and Japan, with a total of 237 functions. In 2001, they presented the show "From Gardel to Piazzolla" in Santiago de Chile. In 2002 they acted on the wedding party of Mázima Zorreguieta and the Prince of Holland. That same year, after touring Europe they also performed in Beirut and again, in the US. In 2003, they performed an opening concert at the Concertgebouw theatre in Amsterdam and acted in the Musichalle Theatre of Hamburg.